Check out the wide variety of SoulDance classes on offer. Remember SoulDance classes can be tailored to your needs. I.E Corporate classes, community group classes, mums and bubs etc. The List is endless. SoulDance is for anyone who wants to DANCE. Genevieve’s passion has always been working with women, so she very happily created SoulDance for women. As always this course is flexible to cater to the needs of each group or dancer. SoulDance for women uses rhythms from Africa and Latin America to allow each woman the space and time she needs to reconnect with herself through movement. Genevieve breaks down the technical side of the movement, allowing each dancer to create beautiful and new shapes in their body. Each class has a meditative and freeform section, allowing each woman to honour themselves and each other through dance and music. Genevieve has created SoulDance for seniors. This course is always adaptable as the requests and needs of the seniors are always priority. SoulDance for seniors provides a gentle and safe workout to a combination of diverse and beautiful music. Genevieve uses her background in Afro and Latin dance to create movement patterns that allow a flowing sense of joy and fun to fill the room. She incorporates some interactive exercises to keep the class social and interactive. There is also a technical aspect which allows for safe dance practice and a deep yet gentle work out. SoulDance for seniors also provides an introspective element allowing the dancers to lose themselves in the music, meditate, or create steps of their own. SoulDance for fitness is tailored for those who are primarily interested in getting a good work out, stimulating their mind and body, and working their bodies in new ways. SoulDance for fitness has an exciting blend of cardio and deep core work. 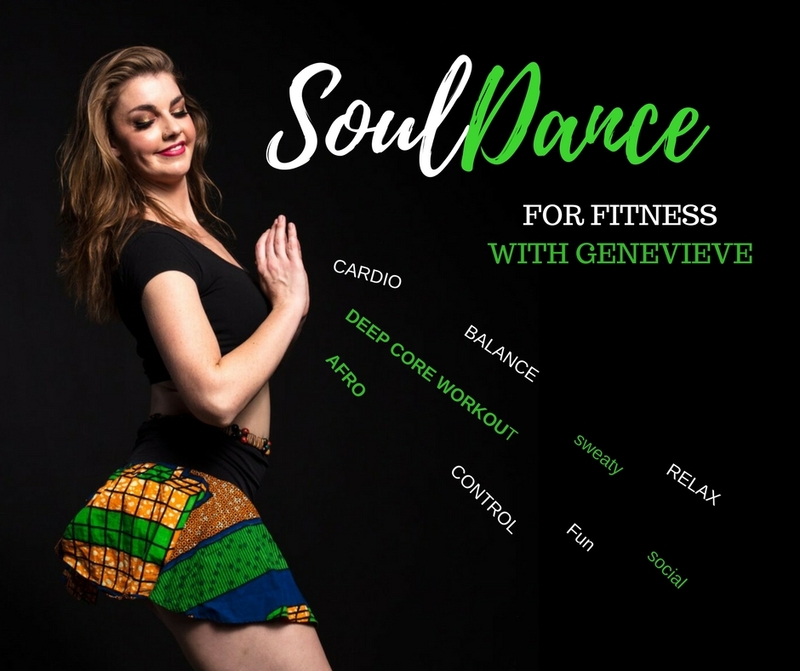 Using a combination of up tempo Afro and latin rhythms to create a high intensity cardio work out, combined with intricate movement patterns, and balance exercises you will leave feeling blissfully buzzed, sweaty and strong. También puedes reservar classes de SoulDance en Español. Genevieve ha estudiado Español por 5 años y también vivir en Colombia durante un ano y media. Ella le encanta los ritmos latinos y sus classes tiene una influencia de las culturas, músicas y bailes latinos.